Inlet: A pipe connected with a tank or a cistern or a reservoir that fills it, is known as an inlet. Outlet: A pipe connected with a tank or cistern or reservoir emptying it, is known as an outlet. 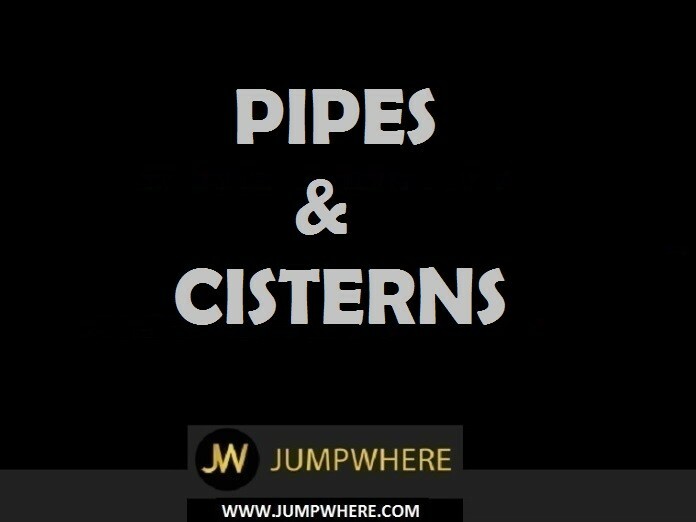 Congratulations - you have completed Pipes and cisterns - Question and Answers. Pipe A and Pipe B can be fill a tank in 20 minutes and 30 minutes respectively. Pipe C can empty the tank in 60 minutes. The tank is initially empty. Both the pipes A and B are opened. Pipe C is opened after 6 minutes. How much time does it take to fill the tank? Three pipes A,B, C are attached to a tank. A and B can fill it in 20 and 30 minutes respectively while C can empty it in 15 minutes. If A,B and C are kept open successively for 1 minutes each, how soon will the tank be filled? Pipe A and B can fill a tank in 1 hour and1 ¼ hours respectively. Both pipes are opened in the beginning and after some time, pipe B is closed. The tank is filled in 40 minutes. Pipe B was closed after? Two pipes A and B can fill a tank in 20 min, when opened simultaneously. If pipe A alone takes 60 minutes to fill the tank, how much time will pipe B alone take to fill the tank? A pipe can fill a tank in an hour. Because of a leak, it took 1 hour and 10 minutes to fill the tank. Find the time taken by the leak to drain all the water in the tank? Two taps A and B can fill a bathtub in 10 minutes and 15 minutes respectively. If A was open for the first two minutes, B for the next two minutes and so on, the bathtub is filled in ? A tank has three inlets A,B and C. C takes twice the time taken by A to fill the tank and B takes half the time taken by A to fill the tank. If they can fill the tank together in 4 minutes, find the time taken by B to fill the tank? Pipe A fills a tank at the rate of 5 liters every hour. Pipe B fills another tank at a rate of 1 litre in the first hour, 2litres in the second hour, 3 in the third and so on. After how many hours will the volume of water contained in the two tanks be equal? Pipe A can fill a tank thrice as faster as pipe B. If pipe A alone can fill the tank i n 20 minutes, how long does it take to fill tank if both the pipes are opened? A tap can fill a bucket in 10 min. Due to a leak in the bucket, it takes 12min to fill. After the tap is closed, the leak empties the bucket in? An empty drum can be filled with 18 buckets of water, if the capacity of each bucket is 16 liters. How many buckets will be need to fill the drum if the capacity of each bucket is 12 liters? Pipe A can fill a tank in 4 hours and pipe B that can fill a tank in 2 hours. Both are opened when the tank is empty. Pipe A is closed 30 minutes before the tank overflows. How long did it take for the tank to overflow? Three pipes can fill a tank in 6, 10 and 15 hours respectively. If they are opened together, how long does it take to fill the tank? There are 10 pipes connected to a tank, some are inlet pipes and the others are outlets. Each of the inlet pipes can fill the tank in 6 hours and each of the outlet pipes can drain the entire tank in 8 hours. If all the pipes are opened when the tank is full, the tank is drained in half a day. How many of them are outlet pipes? Water flowing from a tap fills a 5 liters can inn 2 minutes. How many such cans can be filled in 1680 seconds? Pipes A fills a cistern twice as faster as pipe B. Pipe A was opened when the tank was empty and after an hour, pipe B was also Opened. Find the time taken to fill the cistern if pipe B alone can fill it in 8 hours? In the first hour, 1/4th of the tank is filled. Pipe X can fill a tank in 5 hour. If pipe Y is also opened, the tank is filled in 3 hours. Find the time taken by pipe Y alone to fill the tank? Water flows from a tap at the rate of 1.2 liters per minutes. If the tap is opened for 3 hours, find the amount of water collected in the tank? Pipes P and Q can fill a tank in 40 minutes and 1 hour respectively. If they are opened together, find the time taken to fill the tank? Three pipes A,B and C take 3 hours to fill a tank. If pipes A and B alone take 6 hours and 9 hours to fill he tank, find the time taken by pipe C lone to fill the tank? Two pipes A and B can fill a tank in half an hour and 1(1/2)hour respectively. An outlet at the bottom of the tank can empty a full tank in 1 hour. If all the three pipes are opened, find the time taken to fill the tank? An outlet pipe can empty (5/7) of the cistern in half an hour. Find the time taken to empty the full cistern. Tap A can fill a cistern in 1 hour and Tap B can fill it in 30 minutes. Tap A is opened first and tap B is also opened after 15 minutes. Find the time taken to fill the cistern? A tank is filled by two taps in half an hour. If the first tap alone takes 2 hours to fill the tank, find the time taken by the second tap alone to fill the tank? A tank can be filled by 2 pipes X,Y and Z, when turned on separately, in 33 minutes, 11 minutes and 22 minutes respectively. If all are turned on for 2 mins and then Y and Z are turned off, find the time taken by X alone to fill the cistern. Two pipes A and B can fill a tank in 36 hours and 45 hour respectively. If both the pipes are opened simultaneously, how much time will be taken to fill the tank? 15 buckets of water fill a tank when the capacity of each bucket in 12 liters. How many buckets will be needed to fill the tank in the same time, if the capacity of each bucket is 18 liters? Pipe A and B can fill a tank in 5 and 6 hours respectively. Pipe C can empty it in 12 hours. If all the three pipes are opened together, in how many hours will the tank be filled? A tap can fill a tank in 6 hour. After half the tank is filled, three more similar taps are opened. What is the total time a taken to fill the tank completely? A cistern can be filled by a atap in 4 hours while it can be emptied by another tap in 9 hours. If both the taps are opened simultaneously, then after how much time will the cistern get filled? Three pipes A,B and C can fill a tank from empty to fill in 30 min, 20 mins and 10 min respectively. When the tank is empty, all the three pipes are opened. A, B and C discharge chemical solutions P, Q and R respectively. What is the proportion of solution R in the liquid in the tank after 3 minutes? Two pipes A and B together can fill a cistern in 4 hours. Had they been opened separately, B would have taken 6 hours more than A to fill the cistern. How much time will be taken by A alone to fill the cistern? A water tank is two- fifth full. Pipe A can fill the tank in 10 mins and pipe B can empty it in 6 mins. If both the pipes are open, how long will it take to empty or fill the tank completely? A tank can be filled by a tap in 20 mins and by another tap in 60 mins. Both the taps are kept open for 10 mins and then the first tap is shut off. After this, the tank will be completely filled in? The remaining 1/3 of the tank is filled by the second tap alone. 12 Buckets of water fill a tank when the capacity of each bucket is 13.5 liters. How many buckets will be needed to fill the same tank, if the capacity of each bucket is 9 liters? Taps A and B can fill a bucket in 12 minutes and 15 minutes respectively. If both are opened and A is closed after 3 minutes, how much further time would it take for B to fill the bucket? Two pipes can fill a tank in 10 hours and 12 hours respectively while a third pipe empties the full tank in 20 hours. If all the three pipes operate simultaneously, in how much time the tank will be filled? A tap can fill a cistern in 2 hours and another tap can empty the cistern in 3 hours. How long will it take to fill the cistern if both the taps are opened? A cistern has two taps which fill it in 12 minutes and 15 minutes respectively. There is also a waste pipe in the cistern. When all the three are opened, the empty cistern is full in 20 minutes. How long will the waste pipe take to empty the full cistern? A tank is filled in 5 hours by three pipes A,B and C. The pipe C is twice as fast as B and B is twice as fast as A. How much time will pipe A alone take to fill the tank? Two pipes A and B can fill a tank in 15 minutes and 20 minutes respectively. Both the pipes are opened together by after 4 minutes, pipe A is turned off. What is the total time required to fill the tank? A pipe can fill a tank in 6 hours. After three fourth the tank is filled, two more similar taps are opened. What is the total time taken to fill the tank completely? If two pipes C and D can together fill a tank in 36 minutes and pipe C alone takes 1 hour to fill the tank, find the time taken by pipe D alone to fill the tank? Three pipes A, B and C can fill a tank in 6 hours. After working at it together for 2 hours. C is closed A and B can fill the remaining pair in 7 hours. The number of hours taken by C alone to fill the tank is? Two pipes can fill a tank in 20 and 24 minutes respectively and a waste pipe can empty 3 gallons per minute. All the three pipes working together can fill the tank in 15 minutes. The capacity of the tank is? Two pipes A and B can fill a cistern in 12 and 15 minutes respectively. Both are opened together but after 3 minutes A is turned off. After how much more time will the cistern be filled? A leak in the bottom of a tank can empty the full tank in 6 hours. An inlet pipe fills water at the rate of 4 liters per minute. When the tank is full in inlet is opened and due to the leak the tank is empties in 8 hours. The capacity of the tank is? A cistern has three pipes A,B and C. The pipes And B can fill it in 4 and 5 hours respectively and C can empty it in 2 hours. If the pipe are opened in order at 1,2 and 3 A.M. When will the cistern be empty? Net part filled in 1 hour	1	+	1	-	1	=	17 . The tank will be full in	60	hours i.e., 3	9	hours. Work done by the leak in 1 hour =	1	-	3	=	1	. Then, faster pipe will fill it in	x	minutes. Part filled by (A + B) in 1 minute =	1	+	1	=	1	. Part filled by the four taps in 1 hour = 4 x	1	=	2	. Remaining part =	1 -	1	=	1	.
x =	1	x 1 x	3	=	3	hours i.e., 45 mins. (A + B)'s 1 hour's work =	1	+	1	=	9	=	3	. (A + C)'s hour's work =	1	+	1	=	8	=	2	. Part filled in 2 hrs =	3	+	2	=	17	. Part filled in 6 hrs =	3 x	17	=	17	. Remaining part =	1 -	17	=	3	. Now, it is the turn of A and B and	3	part is filled by A and B in 1 hour. Total time taken to fill the tank = (6 + 1) hrs = 7 hrs. Remaining part =	1 -	1	=	2	. Volume of 1	part = 3 gallons. Then, pipes B and C will take	x	and	x	hours respectively to fill the tank. Part filled by A in 1 min =	1	. Part filled by B in 1 min =	1	. Part filled by (A + B) in 1 min =	1	+	1	=	1	. Both pipes can fill the tank in 12 minutes. Part filled in 4 minutes = 4	1	+	1	=	7	. Remaining part =	1 -	7	=	8	.
x =	8	x 1 x 20	= 10	2	min = 10 min. 40 sec. The tank will be full in (4 min. + 10 min. + 40 sec.) = 14 min. 40 sec.